We talk in-depth about each of these products later in this post. What is a Paleo Protein? Good question, and one in which we hope to answer for you in this article. By the time we finish, you should have a good working knowledge of things like dairy-free protein powders, grass-fed beef protein powders, and many other forms of protein that help maintain your paleo lifestyle. The basic concept of paleo, as you already know, is that you should eat natural foods that we used to eat before agriculture messed things up for our bodies. And before we depended on farming, we used to have a diet that was high in fat, protein, and pretty lean on carbs. You still get a good amount of carbs from the fruit and potatoes that you eat on this diet. But that’s nothing compared to what normal people choose to put in their bodies every day. That deficiency in carbs, as well as the increased protein, encourages your body to burn fat rather than store it. As long as you can maintain a high ratio of protein and fat to carbs, you can lose weight and still eat until you are full and satisfied. So, to help you along the way, you can take a paleo protein, a healthy protein powder or bar, to encourage your body to burn your fat away. They’re low on carbs, and they don’t have the additives of wheat or dairy that you’re trying to avoid on your paleo lifestyle change. But the selection can be overwhelming. 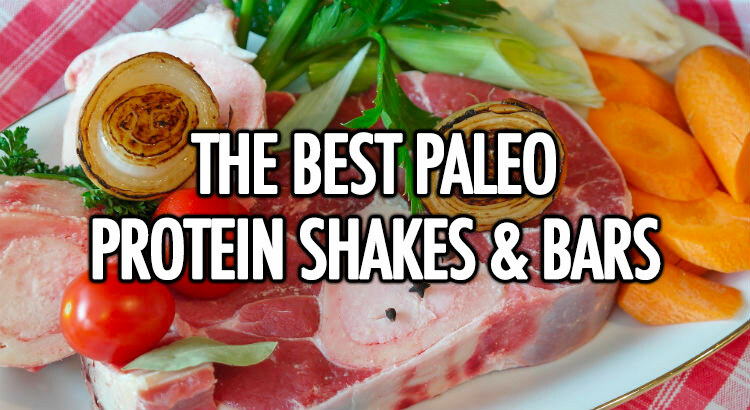 That’s why we created a handy go-to guide for choosing the best paleo proteins that you can get your hands on. Congratulations, you now have no excuse to be the best version of yourself that you can be. You probably think all protein powders are gross, gluggy, and taste terrible. That’s a fair call on some of the brands we’ve tested. Some protein powders just aren’t trying to keep you interested. But that’s not for you. We want to give you the best protein powder recommendations that not only meet your dietary requirements to stay fit and trim. But also keep you coming back for more with these fantastic tasting shakes. It’s hard enough to overhaul your entire life and eating habits with a paleo diet. So why make it more difficult than it has to be? Why should you force down an egg white protein powder when it tastes like the dirt from under your back veranda? If we’re going to give you a recommendation, it’s because we believe these protein powders exceed the expectations of a regular supplement. These actually taste great, and they don’t feel like a chore to take. One of the main sources of protein from a paleo protein mainly comes from one of two sources. Either it’s a plant-based protein, like soy or rice, or it’s a meat protein. Ancient Nutrition Bone Broth Protein have created the best vanilla protein powder. This Bone Broth protein powder comes right from the healthiest sources of nutrients; the very bones of the meat protein. Bone broth has been used for centuries to improve health and treat illnesses. Now you can enjoy a Bone Broth protein powder, packed with good amount of protein as well as vital nutrients for gut health and a boost to the immune system. 20g of protein and less than 2g of carbs per serving is a great way to get your best-tasting vanilla paleo protein powder shake down every day. It boosts your intake of protein and keeps you healthy while doing so. Not a bad deal, and one of the reasons it made the list. One of the hardest sacrifices for those on the paleo diet is the loss of chocolate. Yes, chocolate is delicious, but it contains sugars and dairy products. Most people assume that they never again will get to enjoy that smooth, creamy taste again. But that’s where they’re wrong. You can now enjoy your chocolate protein powder shake without feeling like you’ve cheated on your paleo lifestyle. Well, it will feel like you cheated, but at almost 21g of protein and less than 0.5g of sugar, you can really splurge on this product. It tastes great and it does your body a world of good without using harmful substances. The all-natural vegetable-sourced protein gives you that instant hit of protein, either after a workout, or during a mid-afternoon lull in your day. It’s the perfect protein shake to supplement your lifestyle change. If you’re living the paleo life, you can eat meat to get your sources of protein. But if you’re also trying to live a vegan lifestyle, it can be hard to find a good source of protein to supplement your body’s needs. That’s where the Vega Essentials protein powder comes in. Even if you’re not a practising vegan, you can still enjoy the pea protein, flaxseed, hemp, and multiple other sources of protein found in this powder. Pea protein doesn’t sound appetising? That’s why they’ve made this all-vegan protein powder chocolate flavoured as well. You can enjoy a fresh shake or smoothie and still get replenished with a luxurious chocolatey taste. We love the crossover between the paleo and the vegan lifestyles. They both have similar goals and use almost the same pattern of eating. That’s why also included the SunWarrior brand of protein powder on our list. SunWarrior is known for producing high-quality supplements that cater to the vegan community. But this plant-based raw protein powder works just as well for the paleo diet as well. Finish off your CrossFit WOD and you’ll be glad to down a protein shake that contains only 4g of carbs and 17g of protein per serving. It’s tough to find a paleo-approved protein bar. Many of the protein bars are made with whey or casein, both dairy products popular in the protein powder world. But that doesn’t work for a normal paleo diet. So, we searched far and wide to get you the best options for a paleo-friendly protein bar you can slip in your bag, and not feel guilty about eating during your 3pm afternoon slump. We carefully picked over bars that were high in sugars, processed carbs, or included dairy or gluten that could sabotage your hard work. And we wanted to offer you a better choice than eating that Mars bar because your stomach was growling before dinner. Eat freely and enjoy these paleo protein bars as a part of your healthy, balanced diet. What first drew us to this convenient protein bar was the huge range of flavours. We were hoping to find a couple different options, but we certainly weren’t ready for the 8 varieties of bars you can get with The Primal Pantry. Every bar is made with 100% real food, with no preservatives or additives needed to enhance the flavour. Our favourite is the Cocoa Orange, but you might be partial to the Apple and Pecan or the Mixed Berries or the Almond and Cashew. Whatever you choose, you can be confident you are only getting the nutrients your body needs in a paleo-approved protein bar. You get a healthy amount of natural fat and protein from the real food used. It’s like getting a condensed version of the snacks you were going to eat anyways. But now there is hardly any prep and no cleanup. Find these paleo bars in store at Tesco, BP or Co-Op, or via Amazon here. Again, because of the crossover between vegan and paleo lifestyle, we’re proud to add this paleo-approved protein bar to the list. The BodyMe brand encapsulates everything you appreciate in a paleo bar. It’s high in protein (made from 3 separate plant proteins), it contains no dairy or wheat, and it’s low in added sugars. Everything in this bar is organic, real and natural. Not only that, we think the Cacao Orange taste is great and goes down easily. Keep your peace of mind intact when you reach for one of these bars as a way to curb your hunger. These are also available on Amazon here. In our search for the best paleo protein bars, we came across Julian’s Bakery. They have entire ranges of protein bars that are paleo approved for your consumption. What we truly love about these bars are the extremely high protein content and the low sugar content. Each bar has over 20g of egg-white protein and less than 1g of added sugar. You’ll love that these bars are friendly to your gut, using only 4 ingredients in the bar, and it holds up really well. In the proper storage, each bar can last up to 18 months. It curbs your appetite for up to 4 hours, which is a great way to avoid the temptation to give in to that packet of crisps calling your name. Paleo proteins, as long as they don’t use dairy or wheat, are an excellent source of your daily intake of protein. Use these bars and powders however you choose. Curb a craving to avoid cheating on your diet. Build muscle and encourage growth with protein after a workout. Whatever you do, be healthy and wise about what you put in your mouth. And we’re happy to add these protein powders and bars to that list.